6.3 Earthquake hits the central Mid-Atlantic ridge. 6.0 Earthquake hits the Banda Sea. 5.1 Earthquake hits the Sea of Japan. In the Indian Ocean: Tropical Cyclone 03b (Three), located approximately 927 nm north-northeast of Diego Garcia, is tracking west-northwestward at 08 knots. In the Southern Hemisphere: Tropical Cyclone 01s (Dahlia), located approximately 924 nm north-northwest of Learmonth, Australia, is tracking eastward at 18 knots. 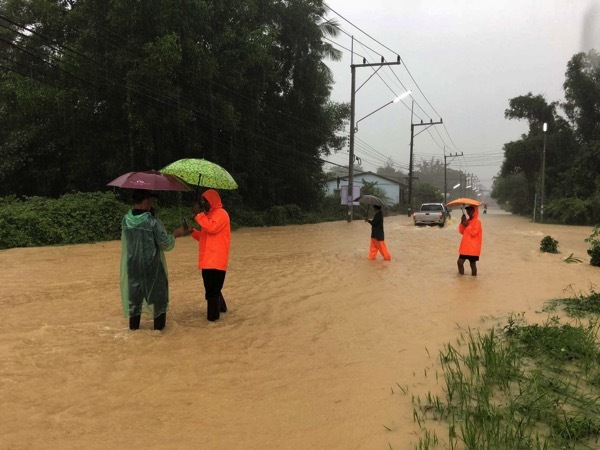 Thailand – Heavy floods swept into southern Thailand this week killing five people, authorities said Thursday as photos of waterlogged and damaged roads spread on social media. The worst-hit provinces are located in the deep south on the border with Malaysia. More than 380,000 people from eight southern provinces have been affected by the rising waters in the southern Thailand but no formal evacuation plan has been announced. Australia – A severe weather warning has been issued for all of Victoria as the bureau prepares for what could be the state’s most significant rain event in more than 20 years. The city will be lashed with more than 100 millimetres of rain – almost double its December average rainfall – over Friday and Saturday alone with thunderstorms and hail likely to accompany the downpour. Bali – Massive lava flows surge down the rivers surrounding Bali’s erupting Mount Agung, as fears grow the volcano is set to blow. 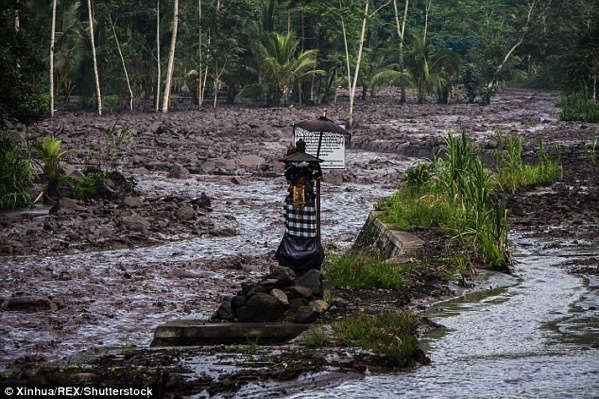 Cold lava flows, also known as lahar, have already flooded the rivers and canals of nearby villages, with many locals ignoring warnings to steer clear. On 26 November dark gray ash plumes rose 2 km at 0505, 3 km at 0545, and 4 km at 0620, and drifted E and SE. Ash emissions continued throughout the day; a few explosions were heard within a 12-km radius. PVMBG issued a Volcano Observatory Notice for Aviation (VONA) elevating the Aviation colour Code from Orange to Red. Satellite data recorded sulfur dioxide gas concentrations ranging from 1,000 to 2,000 tons/day. Ashfall was reported in several areas downwind including North Duda (9 km S), Duda Timur (12 km S), Pempetan, Besakih, Sideman (15 km SSW), Tirta Abang, Sebudi (6 km SW), Amerta Bhuana (10 km SSW) in Klungkung, and some villages in Gianyar (20 km WSW). Ashfall was the thickest (5 mm) in Sibetan (11.5 km S). News sources noted that Lombok International Airport closed during 26-27 November. PVMBG raised the Alert Level to 4 (the highest level on a scale of 1-4) on 27 November, and the exclusion zones were expanded to a general 8-km radius and to 10 km in the NNE, SE, S, and SW directions. Dense ash plumes continued to rise 2-4 km above the crater rim. Based on satellite data, the Darwin VAAC reported that ash plumes rose as high as 9.1 km (30,000 ft) a.s.l., or just over 6 km above the crater rim. Pictures and video showed a white steam plume adjacent to a gray ash plume rising form the crater, signifying two distinct active vents. 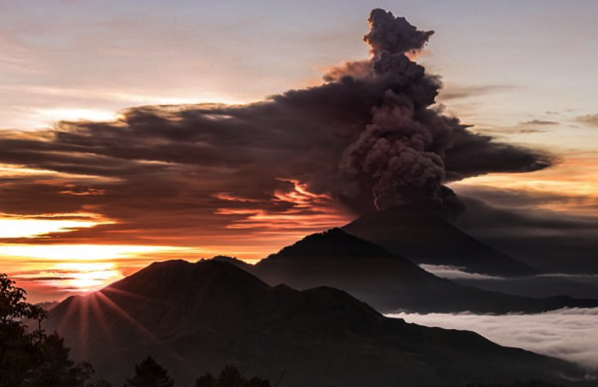 According to news articles the Ngurah Rai International Airport in Bali closed due to the airborne ash. On 28 November BNPB noted that the number of evacuees had increased to 38,678, and were distributed in 225 evacuation centers. The Ngurah Rai International Airport reopened on 29 November, after the Aviation colour Code was lowered to Orange. Great Sitkin | Andreanof Islands (USA) : Recent observations of a robust steam plume and a period of gradually increasing seismicity over several months at Great Sitkin prompted AVO to raise the Aviation colour Code to Yellow and the Volcano Alert Level to Advisory on 22 November. On 19 November local observers photographed a light-coloured vapor plume rising about 300 m above the vent and drifting 15-20 km S. A satellite image acquired on 21 November showed steam continuously jetting from a small fumarole on the W side of the 1974 lava flow within the summit crater, and at least one area where snow and ice had been melted. During the week ending Nov 25, Nigerian health officials reported 14 new confirmed monkeypox cases in the outbreak that began in September, bringing the total confirmed cases to 56. 5.7 Earthquake hits near the coast of central Peru. 5.3 Earthquake hits the Norwegian Sea. 5.2 Earthquake hits the Pagan region in the North Mariana Islands. Indonesia – Rain-triggered landslides and floods have killed 11 villagers on Indonesia’s main island of Java. Nine people were buried by landslides before dawn Tuesday in two villages in the East Java district of Pacitan. Two other people drowned in floods that inundated thousands of houses in 13 villages in the same district. Torrential rain since Monday has caused rivers in the area to overflow their banks. Malaysia – Malaysia’s east coast monsoon floods claimed a second life on Tuesday (Nov 28), while over 10,000 people from Terengganu and Kelantan have been forced to evacuate to relief centres. Kelantan saw a steep rise in the number of flood victims after scattered thunderstorms on Tuesday night, with over 8,000 people seeking shelter at relief centres as at noon on Wednesday, compared to just over 5,000 people on Tuesday night. Indonesia on Tuesday extended the closure of the airport on Bali as ash from a volcano swept the island, stranding thousands of tourists as authorities tried to persuade villagers to leave their homes near the erupting mountain. The airport on Lombok island, to the east of Bali, has since been reopened, authorities said, as wind blew ash westward, toward the southern coast of Java island. 5.0 Earthquake hits Antigua and Barbuda. Greece – Update – Greek authorities on Monday raised to 23 the death toll from heavy flooding near Athens this month, after one more body was found and an injured woman died in hospital. Gaza – Dozens of homes and shops flooded and many roads in Gaza City were blocked yesterday night due to heavy rainfall in the Gaza Strip. Eyewitnesses reported that the areas most affected by the heavy rainfall were Al-Shuja’iyya, Al-Zaytoun, Al-Tuffah, Sheikh Radwan, and Muftaraq Al-Sahaba, as rain water flooded homes and shops in these areas and dragged many cars away. New Zealand – Homes flooded and a school sustained “significant” damage after 42.2 millimetres of rain fell in Roxburgh within a couple of hours on Sunday afternoon. The flash flooding closed roads, leaving the small town isolated on Monday and residents cleaning up mud and silt. Residents of a Central Otago town recovering from widespread flooding are being told to expect to be without water until at least Wednesday. Climate change is turning Israel into a permanent wintering ground for some of the 500 million migrating birds that used to stop over briefly before flying on to the warm plains of Africa, Israeli experts say. The birds now prefer to stay longer in cooler areas rather than cross into Africa, where encroaching deserts and frequent droughts have made food more scarce. 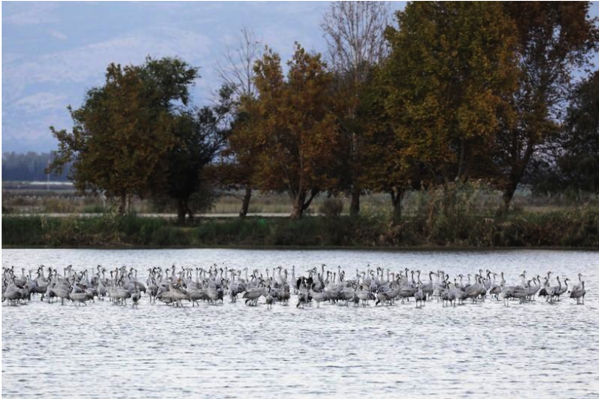 Cranes are one of the most abundant species to visit the Hula wetlands and Agmon said that the number that prefer to stay in Israel until the end of March has risen from less than 1,000 in the 1950s to some 45,000 currently. Although migrating birds are a welcome attraction for ornithologists and tourists, their hunger for food from crop fields makes them a menace to farmers. Environmental groups have warned that the olive oil industry across the Mediterranean, worth billions of dollars, is under threat due to climate change. From Italy to Tunisia, and Lebanon to Greece, increasingly hot summers and unpredictable winters have seen yields decline by as much as 20 percent. 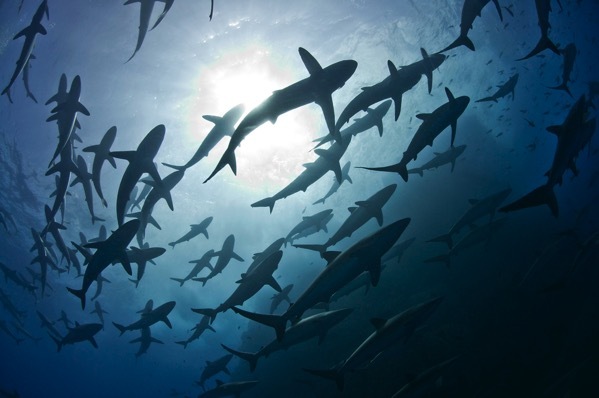 The Revillagigedo Archipelago, a chain of four volcanic islands in the Pacific Ocean near Mexico, is home to a spectacularly diverse community of sea life, including dozens of fish species found nowhere else on Earth. Mexico’s President Enrique Peña Nieto recently designated these islands and the surrounding waters as a marine reserve and national park, prohibiting natural resource extraction, commercial fishing and development, to preserve the island ecosystems and marine life. Since 2009, cases have been steadily increasing in several East Asian countries, including Vietnam, South Korea, Hong Kong and mainland China. Since the beginning of Oct. 2017, Zimbabwe has seen more than 1,000 typhoid fever cases in and around the capital city of Harare. Reports indicate however, that the incidence of new cases is declining. Since the beginning of the year, the Liberia Ministry of Health has reported a total of 70 suspected Lassa fever cases including 21 deaths (case fatality rate 30%) from nine counties in Liberia. Out of this, 28 cases have been confirmed as Lassa virus infection, including 10 deaths from six counties. Last month, a human rabies case and fatality was reported in Highlands County, the first human case of rabies acquired in Florida since 1948. Today, the Florida Department of Health reported that from Jan. 1 to Sep. 30, 60 animal rabies cases were reported across the state. Twenty-six cases were reported in raccoons, followed by bats (16), cats (9), foxes (6), skunks (2) and one dog. 6.0 Earthquake hits New Ireland, Papua New Guinea. Kenya – Numerous vehicles were marooned as heavy rains cause flooding in Narok Town on November 26. The flash floods caused a traffic snarl-up at the Enkare Narok River as motorists waited for the water to subside. The business district was also flooded forcing traders out of their stores. Thailand – As heavy rains continued to fuel rising rivers and canals, residents in six Trang districts near the Banthat Mountain Range have been told to move their belongings to higher ground due to possible floods. As of Sunday morning, floods had already hit many low-lying parts of Muang, Na Yong, Huay Yot and Rassada. Homes in Muang’s Tambon Na Yong Tai were under up to 80 centimetres of water, while a kilometre-long section of Trang-Phatthalung Road in Na Yong’s Tambon Lamore was under 30cm of water and was impassable for small vehicles. Vast areas of farmland have been submerged since Saturday evening. The Uganda Ministry of Health (MOH) and Ministry Of Agriculture, Animal Industry and Fisheries (MAAIF) are reporting that there is an outbreak of Rift Valley Fever (RVF) in Kiboga and Mityana districts. 2 deaths were reported. From the 1 August through 22 November 2017, a total of 2348 confirmed, probable and suspected cases of plague, including 202 deaths (case fatality rate 8.6 %), were reported by the Ministry of Health of Madagascar to WHO. There were 1791 cases of pneumonic plague, of which 22% were confirmed, 34% were probable, and 44% were suspected. In addition to pneumonic cases, there were reports of 341 cases of bubonic plague, one case of septicaemic plague and 215 cases with type unspecified.